In Historic Shift, U.S. Government to End Use of Deadly, Costly, Negligent Private Prisons | Democracy Now! investigative reporter, author of a series on federal private prisons for The Nation magazine. In what some are calling a historic change in policy, the Justice Department says it will phase out the use of privately run federal prisons. In a memo describing the policy shift, Deputy Attorney General Sally Yates said research showed private prisons “simply do not provide the same level of correctional services, programs, and resources” and “do not save substantially on costs,” either. Yates added that government education and training programs for prisoners “proved difficult to replicate and outsource” in the private sector. In the memo, she said as the contracts for 13 private federal facilities come to the end of their terms over the next five years. Some 22,000 federal prisoners out of a total of 193,000 will eventually be impacted by the move. Most are immigrants convicted of crossing the border without permission—charges that currently account for 50 percent of all federal prosecutions. This follows a series of reports by investigative journalists. In our first segment, we speak with reporter Seth Freed Wessler, whose yearlong probe for The Nation and Reveal News uncovered dozens of questionable deaths and years of dire warnings from internal monitors at the private prisons now set to lose their contracts. StoryFeb 23, 2007Raymondville: Inside the Largest Immigration Prison Camp in the U.S.
JUAN GONZÁLEZ: We begin with news that some are calling a major reversal of U.S. prison policy. On Thursday, the Justice Department announced it plans to phase out the use of privately run federal prisons. In a memo describing the policy shift, Deputy Attorney General [Sally] Yates said research showed private prisons, quote, “simply do not provide the same level of correctional services, programs, and resources” and “do not save substantially on costs,” either. Yates added that government education and training programs for prisoners, quote, “proved difficult to replicate and outsource” in the private sector. In the memo, she said, as the contracts for 13 private federal facilities come to the end of their terms over the next five years, quote, “the Bureau [of Prisons] should either decline to renew that contract or substantially reduce its scope.” Some 22,000 federal prisoners out of a total of 193,000 will eventually be impacted by the move. Most are immigrants convicted of crossing the border without permission—charges that currently account for 50 percent of all federal prosecutions. AMY GOODMAN: The Department of Justice announcement will have no direct impact on private immigrant detention facilities, which contract with the Department of Homeland Security. It also has no direct bearing on contracts for privately run prisons at the state level which house less than 7 percent of the total state prison population. But the news still sent stocks plummeting—Corrections Corporation of America, The GEO Group and Management and Training Corporation, which operate the 13 federal prisons. CCA issued a statement today saying, quote, “We are disappointed with the BOP’s decision to reduce its utilization of privately operated facilities to meet their capacity needs, and believe our value proposition remains strong. … At this time the contracts at the three facilities CCA operates on behalf of the BOP remain unchanged, and the BOP will determine whether to extend these contracts at the end of their respective contract terms,” unquote. The statement noted the contracts account for 7 percent of CCA’s total annual revenue. All of this comes after a report released last week by the federal inspector general that found federal prisons run by private companies are substantially less safe and secure than ones run by the Bureau of Prisons, and feature higher rates of violence and contraband. It also follows a series of reports by investigative journalists. Some documented riots at these facilities in recent years, sparked by substandard food and medical care, and poor conditions. In other cases, prisoners have suffered in silence until their plight was exposed. For more, we’re joined by three of these journalists. Seth Freed Wessler’s yearlong probe for The Nation and Reveal News uncovered dozens of questionable deaths and years of dire warnings from internal monitors at the private prisons now set to lose their contracts. He’s joining us via Democracy Now! video stream from Maine. Also joining us here in New York is Democracy Now!’s Renée Feltz, the criminal justice correspondent who has reported for about a decade on private immigrant detention centers. 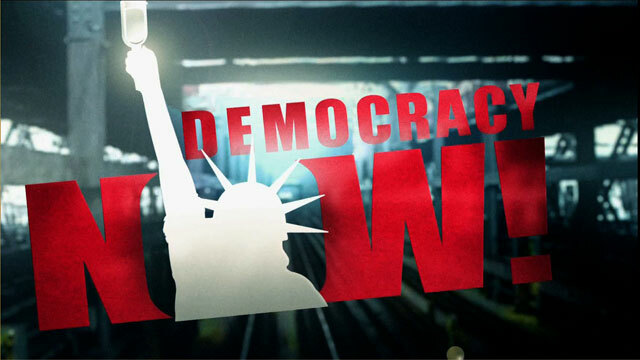 We welcome all of you to Democracy Now! Seth Freed Wessler, let’s begin with you. Talk about the significance of this historic announcement out of the Justice Department that they’re closing for-profit prisons that are run by the DOJ. SETH FREED WESSLER: Well, yesterday’s announcement by the Department of Justice came as a surprise to nearly everybody outside and inside the Bureau of Prisons. What the announcement says is that the Bureau of Prisons, the Federal Bureau of Prisons, over the next several years, will have to start shutting down its private prisons. You know, few people know that the federal government has established, over the last two decades, a sort of subsystem of federal private prisons used exclusively to hold noncitizens convicted of federal crimes. And these prisons have been the sites of repeated protests by prisoners, as I’ve documented in my reporting, and, as I found in an investigation for The Nation, deep and systemic failures to provide baseline levels of care to prisoners held inside, dozens of deaths of men who are held in these facilities, after substandard, negligent medical care. And so, this decision by the Department of Justice will begin a process of shuttering these very facilities that I’ve been investigating, where protests have erupted over the years. And over the next five years, we’re going to see these prisons close. There are 13 of these federal prisons operating right now, scattered around the country, in Texas and California and the South and elsewhere. And I spoke yesterday to the relatives, actually, of several men who died inside of these facilities after pretty extreme kinds of medical neglect. Both of those families said that they felt that this decision to close these facilities brought some kind of justice, if too late for them. It’s a big decision. JUAN GONZÁLEZ: Well, Seth, you mentioned that this policy has been in effect about two decades. Actually, it was in the mid-1990s, during the Bill Clinton administration, actually, that this began. We normally associate privatization of government services with Republicans. This actually started under a Democratic president. What was the original rationale for them? SETH FREED WESSLER: That’s right. Well, as the federal government was beginning to incarcerate more and more people, and the size of the federal prison population was growing, the federal government, Congress and the White House, decided to begin a process of privatizing a subset of federal prisons to meet their capacity needs. In several years after the process began, the government actually decided, quite explicitly, that immigrants, noncitizens, would be an ideal group of people to be held in these stripped-down federal prisons. The government has said in statements, the BOP has said it in statements, that the immigrants, because they will later be transferred to immigration authorities and deported, that the government doesn’t have to provide them with the same kinds of rehabilitative or re-entry services that they might provide to U.S. citizens, that immigrants are an ideal group for these kinds of segregated subsystem of prisons. These facilities have expanded rapidly over the last 15 years as the number of immigrants who are prosecuted criminally for crossing the border has grown massively. Last year, 70,000 people were prosecuted in federal courts for border-crossing crimes, for entry after deportation or illegal entry. And this has helped to expand the federal criminal justice system and expand these private prisons. AMY GOODMAN: We’re going to go to break, then come back to this conversation. Seth Freed Wessler is an investigative reporter. His series on federal prisons, a latest piece, “Federal Officials Ignored Years of Warnings About Deaths in Private Prisons.” This is Democracy Now! We’ll be back in a minute. Raymondville: Inside the Largest Immigration Prison Camp in the U.S.